According to Belarusian authorities, a book by political prisoner Ales Bialiatski can “damage the image” of the country. That was confirmed in a recent letter from the Ashmiany regional customs office to Tatsiana Raviaka, Bialiatski’s colleague from Human Rights Centre Viasna. In July 2013 its officers confiscated 40 copies of Bialiatski’s book “Enlightened by Belarus”, as they were being transferred from Lithuania, where they had been published, to Belarus. Now Raviaka has been told to “re-export the copies of the book to Lithuania” as it has been included on a blacklist of goods that are barred from the territory of the Customs Union of Belarus, Russia and Kazakhstan. The exact reason for including Bialiatski’s book on the list is not mentioned. After it was first inspected, authorities conclude it could “be harmful for the image of the Republic of Belarus”. However, the State Customs Committee of Belarus itself admitted this justification did not match the legal requirements for a ban, and a second inspection was initiated. The results of this are unknown, besides providing ground for banning the book. The actual contents of the book may also play a part in the decision to ban it. “Enlightened by Belarus” is a collection of essays on the history of the Belarusian literature. Before joining the human rights movement he was a post-graduate student at the National Academy of Science and a director of Maksim Bahdanovich literature museum in Minsk. Several essays contain critical assessments of literary works by Belarusian political prisoners, like Uladzimir Niakliaeu and Aliaksandr Fiaduta, written behind bars as they had been arrested after protests on 19 December 2010. “Ales introduced a notion of ‘Belarusian prison literature’. In fact his book points out that for decades writers in Belarus have been persecuted and put in prisons, from the times of the Czar Russia and Soviet repression, to present day,” says Tatsiana Raviaka, adding that the state censors cannot allow free distribution of the views on the literary process presented in Bialiatski’s book. She and her colleagues from Human Rights Centre Viasna are going to appeal the ban. Ashmiany regional customs office is known for its close attention to “dissent literature.” In April 2013 it confiscated a Belarus Press Photo album, which a court later ruled to be “extremist”. 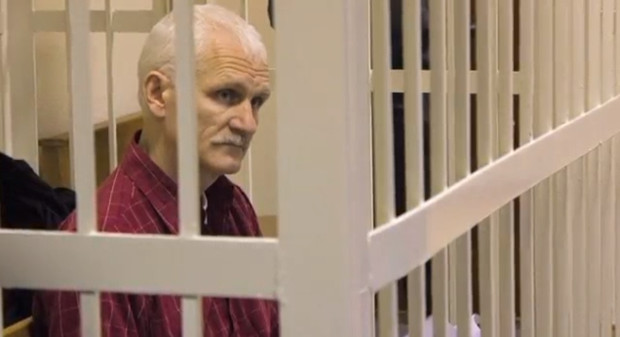 Ales Bialiatski was arrested on 4 August 2011 and later sentenced to four-and-a-half years in prison. Despite charges of tax evasion, the country’s civil society and the international community see his prison sentence as punishment for his principled stance in support of human rights in Belarus.